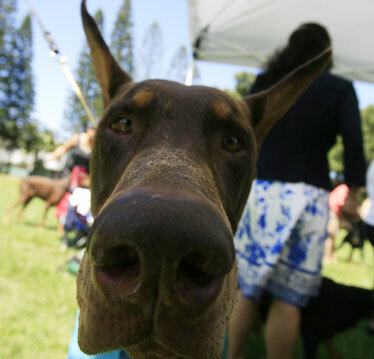 Keahi the Doberman, owned by Amy Fujinaka, took an inquisitive sniff at the camera lens. Alongside breeds considered more "family friendly," Doberman pinschers -- an alert, energetic bunch -- barely register a second glance. Ask Meredith Knight, a dog owner who brought her golden retriever, Max, 4, and Doberman, Chopper, 2, to Mililani Waena Park to watch a specialty show held Sunday by the Doberman Pinscher Club of Hawaii. While parents and children in general will stoop to pet the chubby golden retriever, they'll generally back away when Knight nudges forward Chopper -- a name given to her Doberman as a puppy by previous owners. The name is ill fitting, as Knight's 6-month-old kitten is more aggressive than the 80-pound dog, said Knight. "People will love up on the golden retriever, but when I say, 'Don't you want to pet (this one)?' The answer is, 'No, that's OK.' But why not? It's not like he did anything wrong! He's great with my other pets." Handler Tina Beatty ran with Sydnee. That's what club members say, too -- that the Doberman is a friendly dog, good around children and other pets. They also say these dogs are the most beautiful of the canine world. At this specialty show -- so named because it's held specifically for the breed -- the only attention paid to Max is from resting Dobermans eyeing the golden retriever from their cages. Otherwise, all other pairs of eyes are on the dogs in the ring. Twice a year the club holds specialty shows in Mililani. 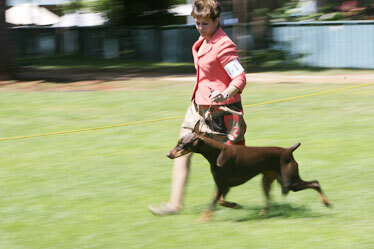 It also holds obedience classes with the Leeward Training Club of Hawaii every Saturday at the park. The winning look of a dog here is a compact, medium-size dog whose coat ranges in shade from black to red, blue and fawn, said judge Janet VanWormer, vice president of the Doberman Pinscher Club of America. This type of show also is referred to as "a beauty contest" by judges, handlers and dog owners, said club President Skip Lee, whose love for his pets is indicated by his license plate, "4Dobie." Sydnee, an 8-month old Doberman owned by Paul and Taryn Perry, settled down after a round of competition during the Doberman Pinscher Club of Hawaii's specialty show Sunday. 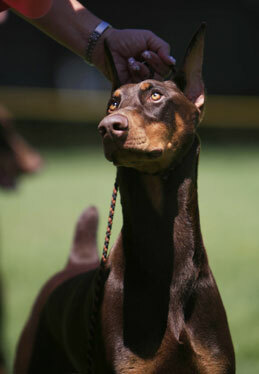 The club has about 25 active members, and typically 10 to 15 Dobermans are entered in each show. "Our goal is to educate people about its function and the breed standards," Lee said. This year marks the 100th since the Doberman pinscher was introduced in the United States. A celebration honoring the centennial is planned for the 2008 DPCA National Specialty Show in October in Topeka, Kan.
With qualities such as loyalty, obedience and watchfulness associated with the breed, the Doberman has often been used as a watchdog, guard dog and police dog. They also served with German shepherds during World War II as U.S. Marine war dogs. Dobermans also served in the South Pacific as mine detectors and messengers. Of the more than 1,000 dogs used, 25 were killed during wartime. The War Dog Memorial was established in their honor in 1988 at the U.S. Naval Base in Guam. 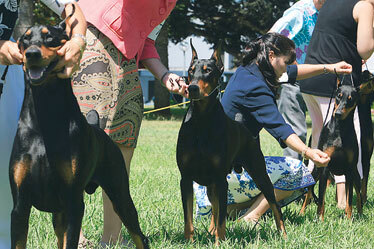 Dobermans were measured and checked by handlers. Partly because of their history of protection, the breed has a reputation as aggressive, said Lee, who owns five Dobermans, but that's not the case. "They were bred to be guard dogs from years ago, unlike the Dobermans of today." "They are good, stable dogs as long as they are cared for properly," VanWormer said. "They don't do well outside. They like to be treated well."